North and north-east firms came away with more than half of the gongs up for grabs at the Federation of Small Businesses (FSB) Scotland Awards in Edinburgh yesterday. Highland businesses triumphed in four of the 12 categories, while small and medium-sized enterprises from Aberdeen, Forres and Shetland were also among the winners. Shetland Distillery Company (SDC), based at a former RAF site on Unst, was named scale-up business of the year. SCD is a partnership between Scotch whisky industry specialist Stuart Nickerson and his wife, Wilma, and Saxa Vord owners Frank and Debbie Strang. 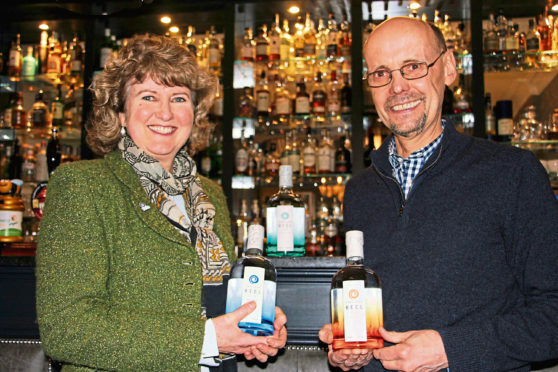 Its gins are award-winning and there are plans to start distilling Shetland’s first single malt whisky. Aviemore-based Quarch Technology, which designs, part-manufactures, sells and exports data storage testing tools, was named international business of the year. The ethical-green business of the year accolade went to Highland Farm Cottages and Cafe, in Dingwall, a popular stop-off for local and touring cyclists. Cruise Loch Ness, of Fort Augustus, was named family business of the year. It has been running boat trips from the banks of Loch Ness since 1968. West Highland Way business Kate Davies Designs, which was founded in 2010 and has grown from producing digital patterns for hand knitters to publishing books and manufacturing wool yarn, won the business and product innovation award. The Wee Hemp Company, of Aberdeen, which specialises in health and wellness products infused with cannabis plant extract, came away with the micro business of the year title, and Forres firm AJ Engineering was named employer of the year. Other winners included two enterprises on Jura, with the island’s only shop picking up the community business of the year gong and gin-maker Lussa Drinks Company landing the start-up award. Skye, Lochaber and Badenoch MSP Kate Forbes hailed the successes of three “wonderful businesses” from her constituency. FSB Scotland policy chairman Andrew McRae said: “Everywhere you look, local businesses are driving local growth, sustaining communities, creating jobs and opportunities.